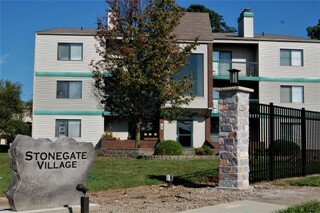 To see the location in Google Maps, CLICK HERE. Or scroll down to the bottom of this page to view a map. Even though my address is Springfield Avenue, Building X is actually off of Kenwood Road (approximately 500 feet south of the Springfield-Kenwood intersection). The building sits at a 45 degree angle to Kenwood Road and is marked with an X (literally! X marks the spot!). Or, if you need a more visual guide, just look for the flower boxes on my deck. 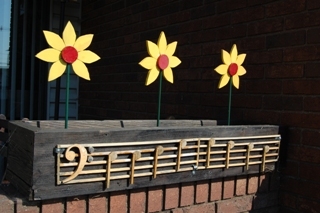 They're easy to spot because they have music notes on them and have yellow and red wooden flowers in them. Also on my deck are some old drums re-purposed as flower pots, a piano keyboard birdhouse, and some windchimes made out of an old percussion cymbal. I made all of that stuff--woodworking and re-purposing old musical instruments is one of my hobbies! When you get to my door, just push the button for X4 and I will buzz you in! Parking is available on both the North and South sides of my building, though the South side is the better choice as it is larger and closer to my side of the building (see the map below). 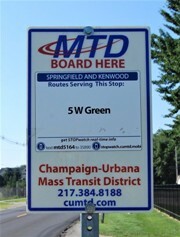 If you ride the bus, then you are in luck as there is a Champaign MTD bus stop (the SPRINGFIELD-KENWOOD stop, SW Far Side) served by the 5W Green Route. This bus stop is right at the edge of the parking lot on the North side of my building. Of course, bus times can vary from day to day, but this bus typically arrives around a quarter past and a quarter before the hour, give or take five or ten minutes. If you do take the bus, there are some great apps you can download at the Champaign MTD website that give you bus arrival and departure times in real time. 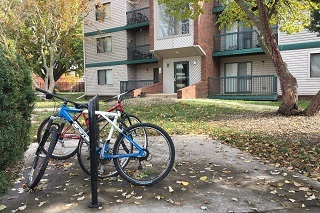 There is a bicycle rack in the courtyard on the west side of my building if you are a cyclist and need a place to secure your bike.